On May 30, 2016 the 'Roots' remake premiered with a largely positive reception from critics and certain people in the community. After watching the first episode in the miniseries, I can definitely say the production quality is high and the cast is full of solid performers. My opinion of the 'Roots' remake has nothing to do with the cast itself. As a former performer, I can tell you that getting in-character to play a role in a production such as the 'Roots' remake I'm sure took an emotional toll on those great actors and actresses who took those roles. They should be commended for taking a role that isn't JUST a performance, but a re-enactment of events that actually occurred and destroyed the lives of millions of people. Slavery was so destructive, it's historical stench still reeks in America today. Like a smell that lingers too long even after the source of the smell is cleaned, or a wound that just refuses to heal fully. I still remember the first time I saw the original Roots when I was a very young boy (I would see it again in History class in high school years later). I don't really remember what year it was, it had to be in the '90's sometime when the miniseries re-aired as it has several times since 1977 when it was originally released. I remember the emotional number it did on me and I can sincerely say this was my first introduction to the two realities of America. Words can't really describe the trauma Blacks go through when they're young and born into a world where they are made aware of the fact that at one point in time...people didn't even think you were Human and used religion and science to justify their barbaric actions against people who look like you. Seeing Kunta Kinte whipped nearly to death simply because he didn't respect the name given to him by people who were not his parents and refusing to go by the name of Tobey is traumatizing to young children. I developed an emotional attachment to Louis Gossett Jr.'s character named Fiddler and distinctly remember crying when he died. I remember the trauma of Kunta Kinte never returning home and dying a slave in a land full of people who would hang him from a tree if he disrespected them. There is a deep barbarism to slavery that really goes unmentioned because people have a difficult time rationalizing slavery in a country set up on democratic principles. Slavery represents the deeply entrenched collective cognitive dissonance of America when it comes to race. Let's be clear, the younger generation needs to see slave movies. They need a constant reminder that this is the base by which America exists today. They need to know about the role slavery has played in the growth of capitalism...not just in America, but across the globe. There have been several good books written on this issue such as 'The Half Has Never Been Told: Slavery and the Making of American Capitalism' written by Edward Baptist in 2014. Then there's also the book 'Christopher Columbus and the Afrikan Holocaust: Slavery and the Rise of European Capitalism' written by John Henrik Clarke. The Nation ran a good article in 2015 about the role slavery played in the rise of capitalism that is worth a read. The article is titled simply 'Capitalism and Slavery' and can be found HERE and delves into the fact that major banks profited tremendously off of slavery. The predecessor of Citibank was actually founded by a banker tied to the slave trade and he was one of the wealthiest men in the country when he died. Wall Street even got its start as a slave market before becoming the center of financial life in America. This is why it's insane to tell Blacks to pull ourselves up by the bootstraps and that reparations isn't up for discussion when this country wouldn't be what it is today without centuries worth of free labor. To pretend Blacks aren't owed anything is historically silly and downright disrespectful to our history and what has been built off the backs of our collective suffering and the suffering of our ancestors. I'll have to digress on that though and bring it back to the 'Roots' remake. I say all of that to say that despite the necessity of the slave story being told, we also have to be real about the fact that these stories are considered safe by the dominant society. Since they're considered safe, they get made more often and have been given the green light by Hollywood more recently. Many of these productions are of very high quality with strong casts and the stories themselves are good stories in terms of how they're structured (12 Years a Slave comes to mind). However that doesn't mean they're the only stories than can or should be told. A few years back, actor/director Danny Glover was trying to get a film made about Toussaint Louverture and the Haitian Revolution that never got off the ground due to a lack of funding and criticism's about him getting some of the money from Hugo Chavez of Venezuela. He initially had some solid actors on board who backed away from the film when this rumor came out and nothing has been heard about it since. Most recently, Nate Parker has made a film that has received positive reviews called 'The Birth of a Nation' which tells the story of Nat Turner's slave rebellion in 1831. The Nat Turner film presents a different take on slave films and it should be noted that Parker's film was funded through a grassroots effort that involved Parker not only putting up his own money, but also getting funding from a couple basketball players and other supportive financiers. It's become clear that elements within the dominant society don't want certain stories about Black people told. Roots is acceptable because the Blacks stayed in their place and didn't rise up. Once we get into the territory of Nat Turner and even further with Toussaint Louverture, then people start acting funny and wanting to call those individuals "controversial." The only thing "controversial" about Turner and Louverture's stories are the inhumane human rights abuses they endured their entire lives. Only people speaking from privilege would say it's controversial for slaves who can be killed at any minute to rise up against said oppression. Back in February, I wrote a blog entry entitled 'The Academy's Race Problem - Why It's Time to Build Black Hollywood & Redefine Black Storytelling.' In that blog entry that can be found HERE I talked about these same problems with regards to not telling our own story the way we want to. Nate Parker in many ways is tackling this problem with his Nat Turner film, but we can't stop there. 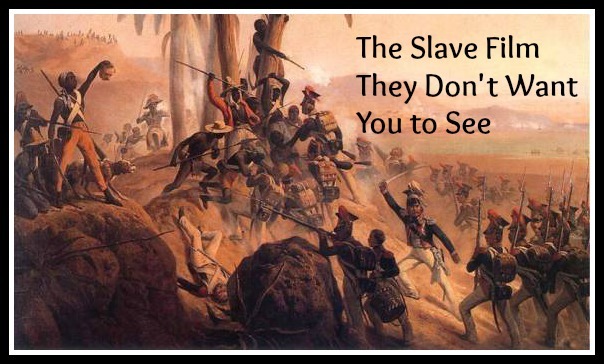 The Haitian Revolution is the greatest slave uprising in history and involves incredible figures. It was such a big deal that it inspired future rebellions all across the Caribbean and in the U.S. The fear of a Black uprising still troubles some in the dominant society which is why they stress conciliation and turning the other cheek over fighting for your human and civil rights. The Haitians not only fought for their rights, they fought for statehood and the overthrow of the slave system and forced France to sell the Louisiana territory to America due to their losing Haiti. Many people in this country have a problem acknowledging the evils of the past and don't want to do anything about correcting those wrongs in the future. Black people have to be mindful of this when it comes to which stories they decide to tell. It's why we need to tell our own stories and support Black films that are released to make it easier for the same types of films to be made in the future. There is more to Black history than subservient slaves and Jim Crow.